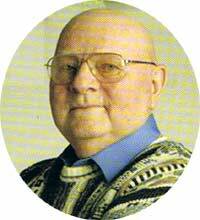 Jim Reid, D.Min, ND is best known for the Time of Day balance he discovered while balancing Dr. John Thie in 1987. Jim is one of the early adopters and promoters of Touch for Health. He used what he termed, "Christian Kinesiology", when serving as a chaplain for the Las Vegas Strip entertainers. He once said, "The Time of Day Balance worked great for this group because they didn't have a long time to spend getting balanced and their unusual schedules were always a challenge!" One day when he was helping Dr. Thie with a back pain, he performed the balance differently than the traditional Time of Day balance and it worked! Dr. Thie said, "Write down whatever it was we just did because it works! My pain is gone." This is the version that is still taught today in TFH classes. Arlene Green, a TFH instructor, likes to use one of Jim's quotes in her classes, "People are down on things they are not up on." Jim is the founder of the International Association of Specialized Kinesiology (IASK) and served as its president for many years. He used Gordon Stokes' mailing list in 1985 to invite this group to join in creating a new organization... 22 people showed up for the first meeting at his office in Las Vegas. Originally, it was going to be called 'ASK', but since a fellow from Australia attended that first meeting, it was an international gathering and became known as 'IASK'. Jim also wrote the first constitution for the organization. 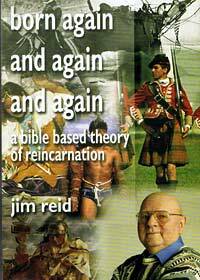 Jim is the author of two books, "Praising God on the Las Vegas Strip" and "Born Again, Again and Again...a Bible-based view of Reincarnation". Jim is known to many, particularly the students of John Thie, as the creator of the Touch for Health Synthesis Tree. This illustration shows the roots of energy kinesiology, and the many new offshoots that it inspired. True to both Jim's and Dr. Thie's devout Christian beliefs, this illustration also showed that strong connection and foundation. Dr. Thie gave a copy of Jim's tree to all of his students so that they could see how this knowledge had inspired and grown whole new branches. Jim's TFH Synthesis Tree was the inspiration and basis for the TFH Interactive Tree created by Earl Cook in 2006. Earl says, "As the 2006 TFHKA conference approached (the first without John in attendance), I pondered ways that I could demonstrate the influence that John Thie and Touch for Health had upon the world and wondered how to build something that would actively bring people together. Jim Reid's TFH Tree did just that, I thought. I wanted to update it and make it interactive to reflect the recent changes and give the connections that are possible using the Internet. John had a real concern that the world of TFH and energy kinesiology had grown so quickly and in so many directions, that it appeared that everyone was going their own direction and failing to remember their roots. So, in the best way that I could, I created an updated, interactive version of the TFH Synthesis Tree. It has taken us awhile to get Jim properly honored and placed on the tree where he rightfully belongs. We are happy now to see this update, thanks to Jan Cole, Arlene Green, Norma Harnack, Wayne Topping and Mat Thie for their assistance and memories. And, of course, thank you to Jim for all of your contributions." 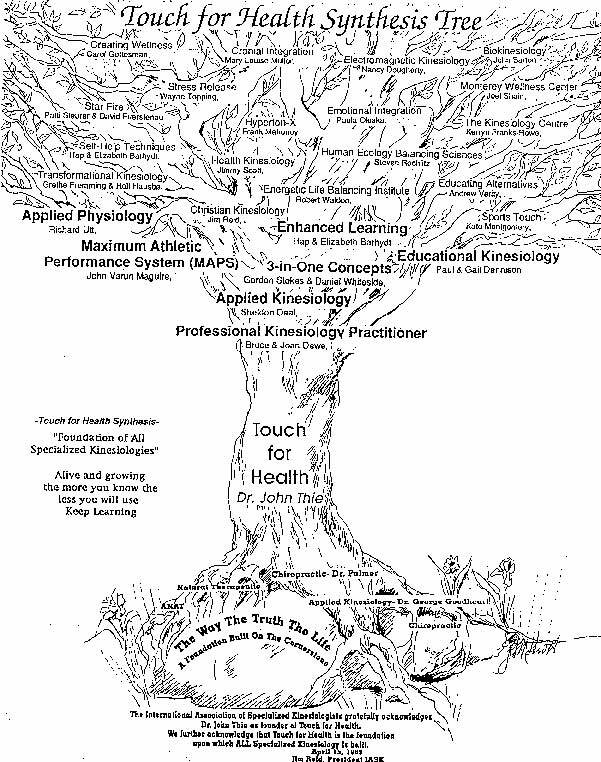 Jim's original Touch for Health Synthesis Tree is shown in the illustration below. We are searching for a good copy of Jim Reid's TFH Synthesis Tree. If you have a copy, please consider either sending the original to us (we will return it after digitizing it), or please send a copy to us.